Reflecting on the day’s Gospel, the parable of the sower and the seeds from Matthew 13, Khabeb said the focus of the story is the harvest and the ways God chooses to “use the terrain of our hearts” to plant the seed of God’s word. Khabeb recalled Jesus’ words from John 12 that a grain of wheat must fall to the ground and die before it bears fruit. “What does it mean for God’s word to die inside of you?” Khabeb asked as she walked among the front rows of the convention hall. “Could it mean that we must release the God that we have created? The God that we have fashioned in our own image? “That God needs to die. The God that we’ve got all figured out, the God that votes like we do, the God that looks like we do, that talks like we do. That God needs to die inside of us so that we can have some fruit. Khabeb underscored the point that the seeds of God’s love are intended for all, comparing the farmer in the parable to Oprah Winfrey. “You get some seeds, you get some seeds, everybody gets some seeds,” she shouted to laughter and applause. When people first heard the story from Jesus, Khabeb said, “they were like, what? Those people over there? They get some [seeds] too? Yes, that’s right. Because otherwise God would be the God of just us and not the God of the universe. See how that works? God cannot be God of the universe if the seed does not fall on everybody. 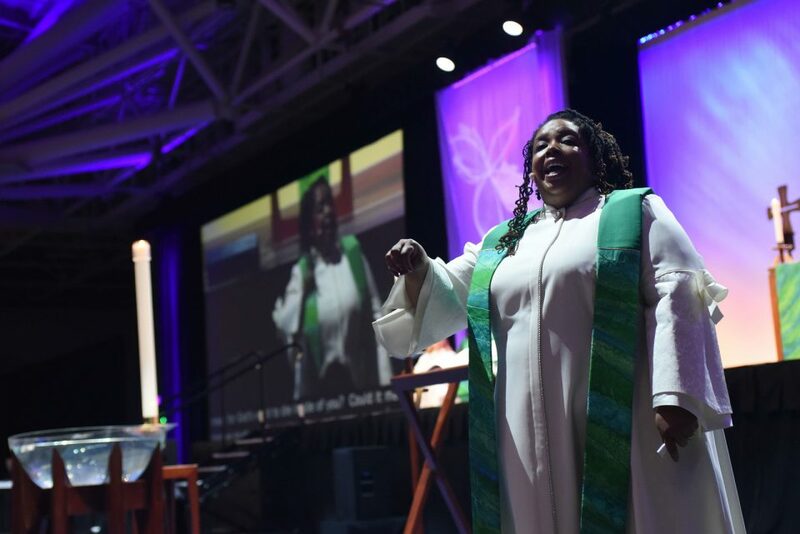 The Women of the ELCA Triennial Gathering was held July 14-16 in Minneapolis. About 3,400 participants attended the event, which included about 1,300 first-time attendees. Just over 400 participated July 15 in the Women of the ELCA’s Run, Walk and Roll 5K. The event raised $19,116 to support the programming and grants of Women of the ELCA’s health initiative, “Raising Up Healthy Women and Girls.” Read the full story. Women across the ELCA donated thousands of in-kind gifts that included more than $19,000 in gift cards, more than 27,000 items of hygiene products, clothing, and quilt kits. The items were collected in the exhibit hall and distributed to various social service agencies. Read the full story for a list of agencies. Matthew lectionary series: What is good soil?